Remember when we all thought that we’d be eating dinner in pill form? Or those squeeze tubes like the astronauts used? Thank goodness that never came to pass. Yes, we have infusions, emulsions and purées, but most of our food stuff is till indentifiable as such. But, by happy accident, I did run across something recommended by Kate F., Girl Reporter on her blog. 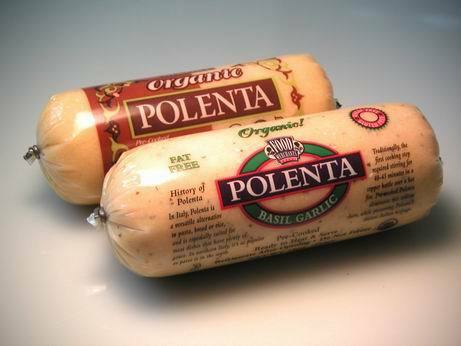 Polenta in a tube. I was skeptical. Shelf stable tubes of food sound particularly unappetizing to me. And then I tried a tube of plain, organic polenta purchased at my local grocery store. It will be a staple forevermore in the Easy and Elegant pantry. Two quick slices fried in a skillet and I had a much more elegant presentation for the Easy and now Elegant white (turkey) chili. (Why I have left over turkey when we attended Thanksgiving dinner at my in-laws still remains a mystery to me.) Tonight I may sauté a link or two of my butcher’s homemade “Della Nonna” sausage in some olive oil, add some chicken broth and Cannellini beans and serve the whole over a slice of the polenta garnished with Italian parsley. For the convenience factor, you can’t beat it. Stock a tube and never worry about impromptu guests again. This entry was posted in Entertaining and tagged polenta in a tube, recipes. Bookmark the permalink. 7 Responses to The Space Age Dinner? Oh, I should really get to work and use up ours. It sits, forlornly, in those plastic casings. “If” there is ever a moment that takes me to the moon, you’d be on the list of what to take, what to wear and how to make it all look easy and elegant. This is great stuff… I’ve been getting it at the Italian grocery for years. It’s soooo simple! Who knew? I’m adding it to the grocery list immediately. Mrs. PvE, it would give dining by moonlight a much different meaning, wouldn’t it? Fairfax, any other secret ingredients I should know about? AL, the plastic is a bit sad. Liberate the stuff! Isn’t this the greatest? So perfect for so many things. Try it cubed and “fried” as croutons in a spinach salad with goat cheese, chopped mago and a balsamic vinagrette. Mmmm. Pingback: La Casa de Rosasharona » Blog Archive » I’ve lost my cooking mojo.